Take a walk on your lunch hour. The benefits of exercise are well known. However, studies have shown that if you break your exercise up into three ten minute sessions per day it is as effective as one 30-minute exercise session. Since most of us are too busy to exercise for thirty minutes at one time, taking a walk on your lunch hour can be one of your ten-minute sessions. 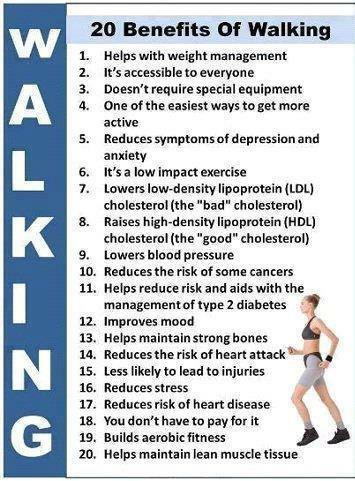 In addition, if you are asking yourself “why should I exercise”, let’s talk about the main reasons for exercising. Exercise reduces stress by producing a relaxation response. You will feel better about all parts of your life. Moreover, your partner, children and co-workers will benefit from your exercise because you will actually be less irritable. Being physically active increases your levels of serotonin in the brain. This provides you with more clarity. It is clear that people who exercise and are active are also more productive at home and at work. Exercise actually gives you more energy. Although it does not seem to make sense that you expend energy and this would actually give you more energy, but that is how it works. During exercise endorphins are released into your blood stream leaving you feeling much more energized. Calories are burned up every time you exercise. And the math is simple. It takes 3600 extra calories to add a pound on to your body. Therefore, if you have pie for dessert you can estimate that it has 500 or more extra calories in one piece. You either need to cut 500 calories out of your next meal or go out and exercise for 50 to 60 minutes at medium intensity. A good method of controlling what you put into your mouth is to know how long you have to exercise to get rid of those calories. For example for one chocolate chip cookie, you need to run a mile. Guess I will not have that cookie! Have you ever noticed if you exercise during the day, you have more energy through the day? If you don’t exercise, it just seems like the day drags on? Movement literally creates energy in our bodies, and motivates us to keep going – which is why you always feel SO great after a good workout.